Matt Kennedy with fellow team members and local people in Ethiopia. In October, Matt Kennedy, pastor of Dillman Church (Warren, Ind. ), spent two weeks in Ethiopia with Joni & Friends International and Christian Horizons Global. The team taught pastors and church planters how to minister to families and individuals with special needs. This trip was particularly meaningful to Matt because he and his wife, Jennifer, have a daughter with autism. The team visited the cities of Asella, Hawassa, and Addis, conducting several days of disability ministry training with national church planters. They were so blessed by the pastors’ desire to reach out to people with disabilities. The pastors desired not just to care for people with disabilities, but to empower those effected by disability to serve in the church. The Ethiopian model churches are training people who are blind and deaf to serve in their churches. Repeatedly, the pastors said that this training had been beneficial in changing their attitudes toward people with disabilities. One highlight for the team was making home visits to families impacted by special needs. This was such a blessing to those families, since the Ethiopian culture views disability as a curse or the result of parental sin being visited upon the children. They never hear that God loves them and views them as beautiful. They do not have people give them gifts and pray for them. Rejection and isolation is the common response to those with disability. On the last day of the trip, the team visited the Center for Mentally Challenged Children. 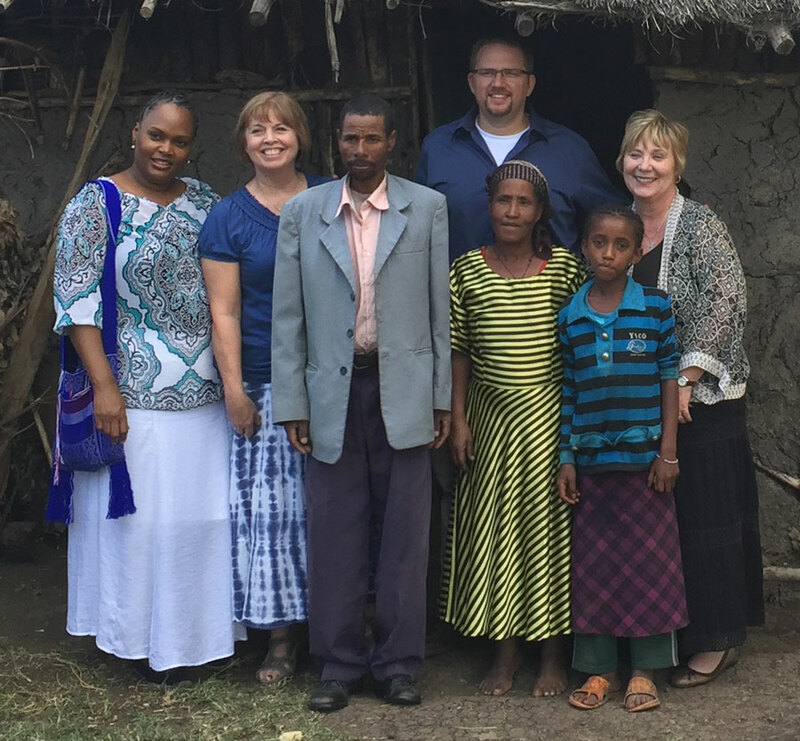 This program began in 1986 as a ministry of the Ethiopia Evangelical Church Mekena Yesus. It started with one child and now serves over 360 children and young adults. The team was deeply moved by the staff and their loving care and professional skills. Through the Early Intervention program, parents are learning how to provide care at home and are seeing how much their children can learn. Their vision is to train their staff, who then transfer that knowledge to the parents. The Center brings disability awareness to the community and local churches. Additional personnel are needed for two construction teams going to Jamaica in February 2016. The first team is the Eden UB Church (Mason, Mich.), which is going to Jamaica the first week in February. They need two persons to assist them. For more information about this, please contact Dwight Kuntz or Martha at the Eden UB Church. The second team is from Living Grace (formerly Union Chapel) in Fort Wayne, Ind. They are going to Jamaica the second week in February. They could use 2 or 3 persons. If interested, please contact Pastor Gary Reiber for more information. His email is <greiber_uc@verizon.net>. Or, you can contact Dwight Kuntz. HU mascot Norm the Forester. Huntington University is participating in a student-led food drive called “U Can Crush Hunger,” which has a goal of raising 125,000 pounds of food. It is sponsored by the Community Harvest Food Bank of Northeast Indiana, Inc. The Oct. 19-31 drive is a friendly competition between five colleges and universities: Huntington University, IPFW, Indiana Tech, Ivy Tech, and Saint Francis. The goal is for each school to collect 25,000 pounds of food. Although Huntington University is the smallest of the participating schools, they hope to win this “food fight” while helping to alleviate food insufficiency in Huntington County. 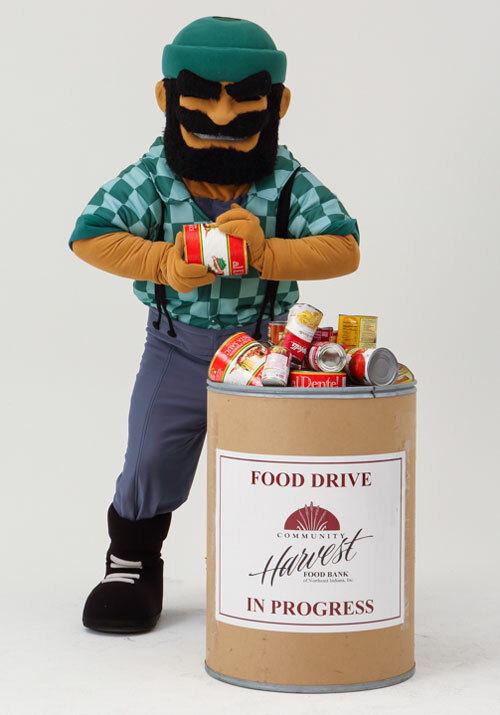 Drop off canned food in the barrels located in the lower level of the Habecker Dining Commons or the first floor of the Loew-Brenn building. Donate. Each $1 = 3 pounds of food! Text HUcrush to 74574. You’ll receive a response text that will direct you to an online form where you can text to give. Again: $1 = 3 pounds of food! Following are some items from Jeff’s report to the October 2015 meeting of the Executive Leadership Team. All Central American conference leaders and delegates are participating in quarterly training events in order to implement the BILD (discipleship and leadership development) model among their churches. BILD is already being used widely throughout our Honduran UB churches. In Sierra Leone, there are very few remaining cases of Ebola. During this time the hospital has done relatively well. Church planting and the construction of a school building continue in the mission region of Pujehun, and conference leaders have remained in contact with our UB churches in Liberia. On November 10-23, 2015, Jeff Bleijerveld will travel with Rev. Brian Magnus, Rev. Joseph Abu, and Rev. Derek Thrush to be introduced to our newest UB churches in Liberia. From there we will travel to Sierra Leone, during which time we will participate in a ministerial retreat with pastors. The Christian Health Association of Sierra Leone (CHASL) recently facilitated the donation of a new Land Cruiser ambulance for the Mattru UBIC Hospital. Currently, CHASL is providing assistance in writing a grant proposal to USAID to pay for the purchase, and also to complete installation of a solar electric system that would power the hospital. The surplus electricity could then be sold to the surrounding community. The profits from these sales would be used to assist in paying hospital salaries. Jamaica will host General Conference February 27–March 4, 2016. Each National Conference has been urged over the past months to raise funds to send their national leader and at least one delegate. Six United Brethren students from Haiti graduated from the Gamaliel Bible Institute. All six received sponsorship assistance from our church in Fowlerville, Mich., and from the U.S. National Office. We continue to dialogue with Macau churches and staff regarding a ministry redesign. It would focus more on a disciple multiplication model. During October, Global Ministries associate director Frank Y teamed with Mike Cook of Huntington University to conduct a staff retreat in Macau. It included Global Ministries and Huntington University staff from China. Jen Blandin recently completed a six-month Home Ministry Assignment and returned to Macau on September 2, 2015. She will be working to implement a new disciple-making strategy. We are completing the process required to purchase property in Chiang Rai. During our last trip in May, we were introduced to a number of Thai church planters eager for the participation of missionaries in their church planting endeavors. We also continued dialogue with the Chiang Rai International Christian School (CRICS) regarding a variety of joint-venture ministries in the region. We are actively promoting opportunities for educators to teach at CRICS. Brian and Rachel Glunt are on full support and are completing a 12-month internship before leaving for Chiang Rai, Thailand. Ignite, a one-day mission information and inspiration event, is scheduled to take place at Rhodes Grove Camp in Chambersburg, Pa., on May 7, 2016. Considerable interest in attending is being expressed. International Needs works among Syrian and Iraqi refugees in Turkey. This work was promoted during our churches’ summer children’s ministry programs. The children raised some $4800 for the project, and another $2900 came from churches. On top of that, $2200 from the Arnold Bible Fund and an individual donor provided for Action Bibles (graphic novel New Testaments) to be distributed among children in the refugee camps. We recently increased to 10% the amount we charge to project donations (previously 7%) and missionary support (6%). This is providing some help to our general budget and is making up for the decline in giving to our general fund. Seth and Rebecca Mallay are members of Hillsdale UB (Hillsdale, Mich.). They have been endorsed to serve as missionaries with World Medical Mission (Samaritan’s Purse) in Togo, West Africa. This past year, we formed an official partnership with the English Language Institute/China (ELIC). Since 1981, ELIC has been placing passionately committed Christians in teaching roles across Asia and the Middle East. A number of United Brethren people have served with ELIC, including Global Ministries Associate Director Frank Y. We are sending churches a packet of information, along with a DVD that contains a short video highlighting our partnership and the opportunity to be involved in either short-term or long-term ministry on ELIC/Global Ministries projects. We recommend that you use it during your announcements on Sunday, November 8, or at your earliest convenience. Through ELIC, we have the opportunity to send a team of eight UB volunteers to work among Syrian refugees in Lebanon next summer. ELIC’s 7+1 program makes it possible for one volunteer to travel free for every seven that join the team. We hope that you’ll take advantage of this unique opportunity and present this ministry to your church family. If you have questions, feel free to contact us at info@ubglobal.org. The official numbers have been released for fall 2015 enrollment at Huntington University. The total enrollment of 1,273 students is the largest enrollment over the past five years, with a 5 percent increase from 2014. Over 120 students identify as members of a United Brethren in Christ congregation. Some notes about the current student body. There are 47 international students, which is an increase from 38 students in 2014. International student enrollment is at its highest point since the 1980s. Overall student diversity is at 10% of overall student enrollment. The largest area of growth comes from graduate programs in Counseling with the launch of the Townsend Institute, and the development of the Master’s in Organizational Leadership. The growth in graduate programs was further fueled by the addition of 32 new students in the Doctorate of Occupational Therapy program, for a total of 64 students. The program accepts a maximum of 32 new students per year. Strong numbers in programs like Digital Media Arts, Business, Nursing, Ministry, and Education continue to provide the foundation for undergraduate offerings. The University successfully launched the Haupert Institute for Agricultural Studies this fall. It now has 16 students, of whom 12 are first-time freshmen. Here is the information for the annual Pastoral Resource Day in Pennsylvania. Address: 7693 Browns Mill Road, Chambersburg, Pa. 17202. Registration deadline: October 26, 2015. Overnight lodging and meals are available. Download this PDF form to register, or call the camp at 717-375-4162. Office hours: Monday and Tuesday 8am – 3pm. On Friday, October 23, another Townsend Institute Symposium will be held at Huntington University. Registration starts at 8 am and the day concludes at 4:30 pm. Two counseling trainings will be held in the morning, both led by Institute Fellows. 3:00. Fred Smith, founder and CEO of The Gathering, a community of Christian givers, will lead Part 2. In addition, there will be Q&A times with Dr. Townsend throughout the day. CEU’s will be available ($40 for 1.5 hours and $75 for 3 hours). The Symposium is free, but registration is required. Please register by 2 pm on October 22. The last Symposium for 2015 will be held December 11th. Jeff Bleijerveld, director of Global Ministries, will lead a vision trip to visit Guatemala, home of our newest national conference. The trip will include participation in their national conference, and visits to local church and project sites. Accompanying the group will be Mark Wallace, a UB minister from Canada and director of Christian Horizons Global. He will introduce team members to some of their work in Guatemala. They have been our partners in Haiti, providing support to UB schools and the development of small business projects. Global Ministries is sponsoring a number of other short-term trips during 2016–to Jamaica, Honduras, Spain, Poland, Nicaragua, Guatemala, and Sierra Leone. While Global Ministries creates budgets for trips, there are always cost overruns as a result of delayed flights, unexpected costs, emergencies, or just being asked by our hosts to do things we hadn’t planned. When these sorts of things happen, Global Ministries absorbs the expenses, since it’s pretty hard to ask for more money once the team returns home. As a result, we have accumulated a sizeable deficit over the last few years—one we’d like to erase. In addition to wiping out our deficit, we’d like to build up an account to subsidize some trip expenses like medicines and supplies for medical teams, or to help small churches that might lack the base needed to raise funds. Information is on its way to each of our churches. Churches have been sent a letter and order form for materials this past week. Bulletin inserts will be sent in the weeks prior to the American Thanksgiving in November.